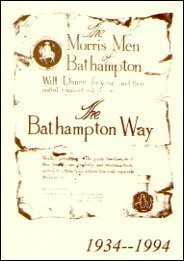 Bathampton Morris Men "The Bathampton Way"
A full history of the Bathampton Morris Men is contained in our handbook The Bathampton Way. The handbook also contains information on how the side is run and guidelines for dancers. Copies may also be purchased from the side for £5.00+p&p.